Another awesome annoucement…we’ve made swaddle sets! 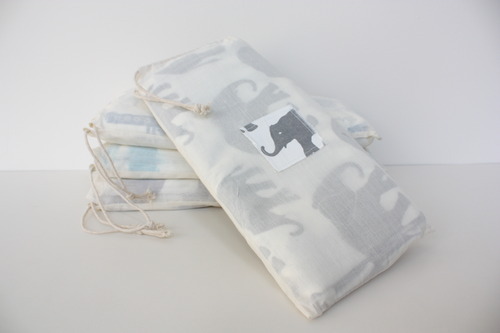 We know how babies feel wrapped in cozy muslin and the new mother’s in your life will surely appreciate a beautiful grey elephant swaddle set. It includes 1 swaddle blanket (48” square), 1 double sided burp cloth (13” x 10.5”), 2 small dab cloths (8.5” square) and comes in drawstring cotton pouch (13.5 x 6.5”). Comes in an assortment of colors and designs available online and in the shop!